My fourth stadium of 2014 was on Tuesday 1st April at Maitlands in Debenham, Suffolk. 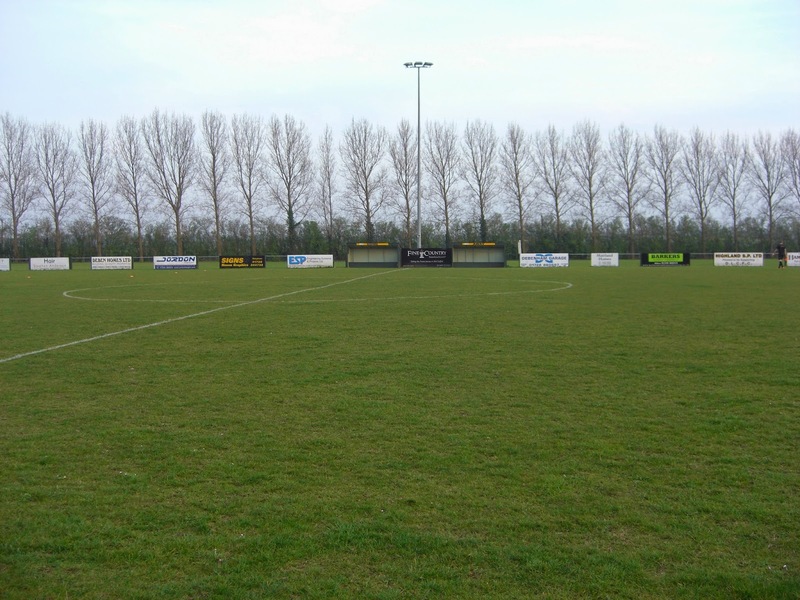 The match was Debenham Leisure Centre vs. Fakenham Town in the Eastern Counties League Division One. Maitlands is part of the Debenham Leisure Centre complex on the western outskirts of the village. The venue is 9 miles from the nearest railway station at Needham Market. The Maitlands venue is on the edge of the Debenham Leisure Centre complex which includes a sport halls, squash and basketball courts and astroturf football pitches. The main entrance building includes a bar and takeaway which backs onto the football ground itself. Maitlands has a 112 seat structure by the half-way line on the northern side of the pitch. The remainder of the ground is uncovered standing with the area behind the goal at the western end of the ground taken up by a grass bank which provides raised views for any spectators watching from here. 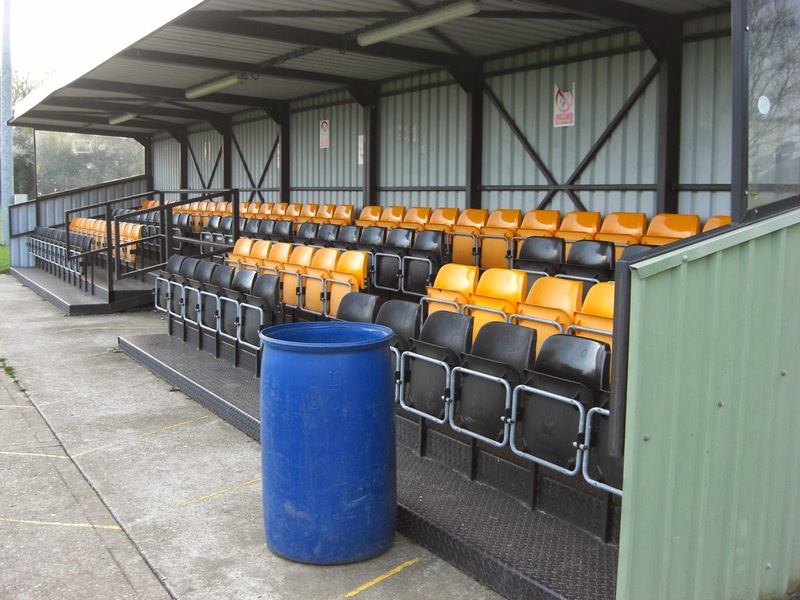 The two dugouts are located on the southern side of the pitch directly opposite the single spectator stand. Fakenham were riding high in the division in a battle for 2nd place and Debenham gifted them an early opportunity to extend their winning run when Ben Green felled Daniel Williams in the penalty area in the 6th minute. Robert Harris's penalty was saved by Debenham goalkeeper Sam Chilvers but Fakenham's Ashley Jarvis was able to react quickly to put the loose ball back into the danger area and Matt Franks rifled the ball into the net to put the visitors 1-0 up. Fakenham were the better side in the opening half and in the 32 minute they doubled their lead when James Page steered the ball through a crowded penalty box into the bottom corner. It appeared that Fakenham were on their way to a comfortable victory but in the 36th minute Debenham pulled a goal back - Sam Chilvers sent a long goal kick towards the opposition penalty box and when Fakenham goalkeeper Tom Rix misjudged the bounce of the ball it fell for Stuart Jopling who was able to nod into the empty net to pull a goal back. The visitors started the second half brightly and on the hour mark their lead was increased again when a long throw looped over several players before landing with Robert Harris who atoned for his first half penalty miss by drilling the ball past Sam Chilvers in the Debenham goal. After this point the game was fairly even with neither side creating too much in the way of goal scoring opportunities as it finished in a 3-1 victory for Fakenham.